Today when a Muslim attacks non-Muslim in America, our leaders, Muslim leaders, and the media tell us these are the actions of “mentally ill” people. Strangely, this nonsense has been going on a long time. For this edition of Throwback Thursday, UTT looks at a forgotten jihadi attack on America. John Allen Muhammad was a U.S. Army veteran and a convert to Islam. 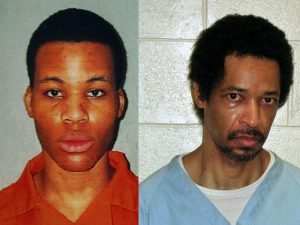 Along with Lee Malvo – a 17 year old – the two terrorized the Washington, D.C. metro area by killing ten people in the fall of 2002. John Allen Muhammad was executed in Virginia for these crimes. Lee Malvo was sentenced to life in prison. Prior to this, the Muhammad and Malvo killed seven people and wounded seven others in a multi-state robbery and murder spree. Four days before the shootings in the Washington Metropolitan area began, Ayman al Zawahiri, the second in command of Al Qaeda, issued a warning that Al Qaeda “will continue targeting the lifelines of the American economy.” The “Beltway Snipers” shot their victims at gas stations, a Home Depot, a Shopper’s Food Warehouse, a Michael’s craft store, an Auto Mall, and a Post Office. John Allen Mohammad was supposedly a “homeless” guy, but he always had money to travel overseas on trips and vacations. Yet, investigators never uncovered a source of funding. After his arrest, Lee Malvo drew pictures in prison. Many of these were entered into evidence by his attorney in an attempt to show how Malvo was influenced by John Mohammad. 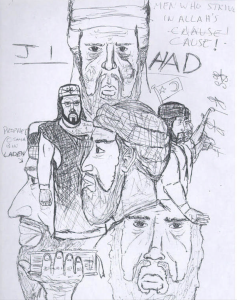 These drawings clearly showed support for Al Qaeda, Osama bin Laden, Islamic Jihad, and the kinds of things that would lead an investigator to conclude these murders were acts of jihad. Maybe it was jihad afterall. Wow. My jaw is dropped again, Sir. Thank you for this information. Ayman al-Zawahiri’s ability to accurately synonymize “lifelines” and crime scenes four days before the “Beltway Snipers” serial killings in the Washington DC metropolitan area actually began suggests a nexus involving abetment — possibly with respect to the source of John Muhammad’s inexplicable funding. and regional command & control. After all, gas stations, Home Depot, Shoppers Food Warehouse, Michael’s Craft Store, Auto Mall and the post office, in the course of any urbanites day, are indeed “lifelines”; I.e., think Nihad Awad, thus CAIR.